October 14, 2018 | Robert Handfield Ph.D. 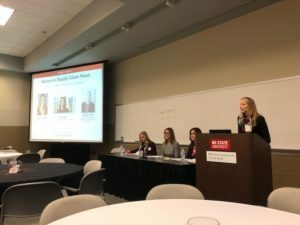 I had the opportunity to sit in on the Women in Supply Chain Panel at the Innovative Women’s Forum, held at NC State University this past Friday October 12. The panel included a number of powerful women, including Amy Rumford, (VP, Supply Chain Operations Service Excellence & Analytics, Advance Auto Parts), Carol Kozar (Corporate Services Procurement Manager, SAS), and Melody Scott (Director, Global Materials Management & Scheduling, Biogen). The session was hosted by Marguerite Murray, one of our current SCM MBA students. All three women shared their thoughts on preparedness for entering the industry, either as a new hire or as a returning professional, about the need to balance a career and family, and how coming out of a technology background helped them get into the supply chain world. Here is a transcript of some of selected. questions and answers from the panel, which offered some great advice to aspiring young women who want to work in the field of supply chain management. Marguerite Murray: SCM has traditionally been a male-dominated field, and women have traditionally operated under the radar, but as it became more global, women have become more predominant. As we go through our conversations, we hope to understand these factors better. Can you share with us a bit about how you ended up working in the supply chain field? Amy Rumford: II came out of Penn State as an industrial engineer, then got my MBA at NC State years later. I started working with IBM as an Industrial Engineer. I worked in supply chain, in finance, as a distribution engineer, led customer fulfillment, and moved to Lenovo in the middle of my MBA program. I worked for Lenovo for 10 years, as a leader in Indirect Procurement, Customer Fulfillment, and led the integration of IBM’s X86 business for the supply chain. I worked at Google for 3 years, and super-commuted across the country. 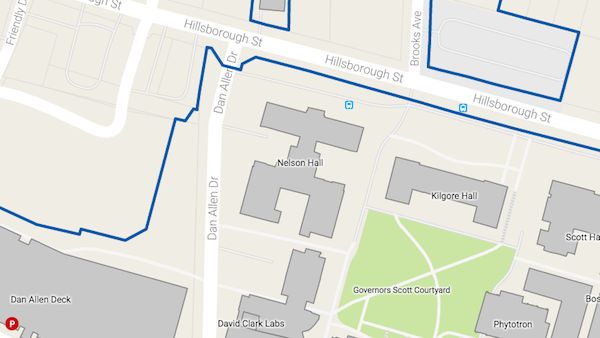 I stretched myself in data center operations, leading operations and PMO for all Google centers globally, but then came back to Raleigh. Since April I have been VP of Supply Chain Operations at Advance Auto Parts, learning a completely different industry. My advice from this path: take advantage of these inflection points in your career. Carol Kozar – I am a practicum advisor for the SCRC, and it has been a great opportunity. I get to help many of the best and brightest – and I am learning from them as well. I graduated from Brown University and worked in technical marketing for a software company and then a medical equipment/pharmaceutical company. My friend was thinking about taking the LSAT, and I didn’t have anything else to do, so I took the class, and applied to law school. I ended up going to law school at UNC. While in law school I did a project on Internet service provider liability, back when AOL was hot. IBM was looking for someone to negotiate procurement agreements with internet service providers including AOL, CompuServe, etc. and that is how I ended up in procurement. I started in manufacturing procurement buying commodities in support of the PC division. I got my MBA. I served as the liaison between xSeries business unit and procurement during the transition of this activity to Lenovo. After that I was technical assistant to the VP of Procurement which was a great opportunity to watch and learn how to manage a large global procurement organization. Then I moved over to indirect procurement and was responsible for IBM’s design and construction procurement globally. While at IBM I had twins. I found I was spending a lot of time on the phone 24/7 – and I needed an opportunity to spend more time with my family. As a result, I moved over to RTI, a non-profit – and got the opportunity to work in a non-profit environment. I had a great learning experience there until I saw an opportunity at SAS and knowing its reputation as a great place to work I had to experience it for myself. Melody Scott I didn’t start in supply chain either but aspired to enter the field at some point in my career. I started in Chemical Engineering at Virginia Tech, and attended NCSU for graduate school, completing a Masters in CE – and earned an MBA from Duke. I worked in consulting, then medical devices, and now at Biogen for 14 years. I started out more on the technical side, focusing on purification in Manufacturing Sciences; we make therapies for many diseases and it is a very rewarding job. I have been able to work into materials planning, initially through a role created on a site level and taken on roles with more scope and accountability. I currently oversee warehousing, materials management and scheduling for our Denmark, Switzerland, and RTP Manufacturing operations. It has been a great experience – the only constant is change – and Biogen has been very helpful in providing opportunities for me. Marguerite: Each of you has worked at different companies and some are re-entering, and some entering the first time. As a woman, you learned characteristics of companies that were good or not – what do you think about fit.? Amy – When you walk in for an interview – you’ve done your research and know the requirements – and you feel like you have already met or can meet those skills. But it is important to consider company Culture, as what they emphasize will impact you every day at work. The second piece is Leadership – understand what is valued by the company and how you can develop and flourish based on the value you bring. It is important to know these when going into the company. And the last piece – Benefits are NOT all the same, and can impact your overall compensation. It is important to understand what is covered and what isn’t. Carol – If you are looking at multiple jobs, put together a scorecard, and understand your priorities. There will be gives and takes. When asked to compare opportunities, it is good to list priorities, and give them a score. It will help you when you start to compare offer to offer, as money is not the only factor. Good to know what those factors are before you interview so that you can evaluate any offers you receive based on those factors. If you have multiple offers, it makes it easier for you to compare and prioritize. Melody – I always consider core values. What are the core values the company cares about and do they align with mine? Outside of the tactical accountabilities, does the company focus on fitness or have a gym, or is nutrition/eating healthy of importance for employees. I need energy to be a good servant leader for my teams and having those things available is important. Ask the interviewee – what is your experience here? Diversity and inclusion is another important issue. Is it a “check the box” exercise, or do they have a robust program in place? Biogen has a lot of programs around diversity and inclusion – and that is something I enjoy. Marguerite – Supply chain has evolved and it is difficult to evaluate different opportunities in supply chain. Do you have thoughts that roles that may be evolving, or positions that are good fits for women? Melody – From a stereotypical point of view, planning is something we are good at – as many women have technical backgrounds and excellent problem-solving skills. Analytics, logistics, and network strategy are great areas for women to consider. Women are great a building relationships also, so areas where interacting with suppliers and partners is important would also be options. Amy – Analytics and project management. Women do both of these very well, and analytics is very big. So much data is involved in planning, inbound part SKU’s, transactions going in and out of the DC, and the ability to take that data and make sense out of it, and make recommendations is a very valuable skill. Carol – Procurement is a great place for women. But I also want to remind people that supply chain procurement is not just for manufacturing. Supply chain principals apply to the procurement of services as well as goods. There are many opportunities for women in procuring and managing services. Marguerite: Being an influential woman in business, your opinions really matter. Supply chain has evolved but it seems like a lot of you have learned about SCM on the job. A lot of graduates come out with technical skills, but not always SCM knowledge. New graduates can emphasize skills, but as leaders, how do you want to be influenced by junior members who come to you and want to work in SCM? Carol – Whatever job you get – do it well. That will get you recognized. But do not be afraid to speak up in meetings. Even if you are the most junior person, if you are asked what you think – throw ideas out there. If there are special projects that get you visibility outside of your role, volunteer and try to lead those activities. These special projects can be a great opportunity for you to influence your organization and get recognized. Amy – I would add on that as you are new in a role, listen and ask questions. As a professional person – listen first. You know your area of expertise, so build that relationship and let them know that you are interested in what they know before you jump in – it is critical in building a relationship. Important in the short run and the long run. Get on a frequent cadence in “one on ones”. I tell my staff members that when they want to meet with me, they own the meeting, and the preparation, and need to be ready with an update on what they are working on. And then let me know the barriers, so that I can help, whether it is resources, a computer, a connection in the organization, or other things with your manager. Melody – I would reiterate, one can’t be curious enough; it is about asking questions and listening before you try to change. New hires are looking through a different lens and bring practical experience. They may be able to spot gaps in existing business processes, and probe areas for improvements and gaps. Also, I would encourage all supply chain new hires to look at key stakeholders – and set up time with them – to understand expectations from you in your role and continue to stay in touch with them in addition to your manager. I want to thank all of these women for these valuable insights, and hope we can invite you back again next year for the second annual Innovative Women’s Forum!